Posted February 25, 2016 by Scott Schaeffer & filed under Economics, Republican Refutations. 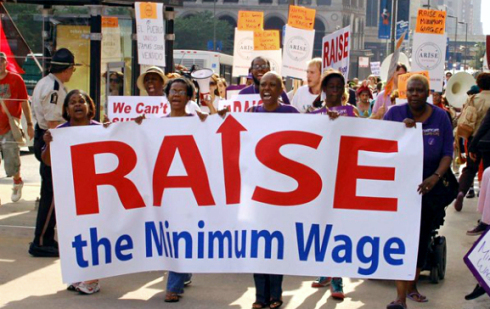 As the minimum wage debate rages on, Republicans, and even some Democrats, tell us that raising the minimum wage would hurt the economy, thus hurting everyone. There are two fronts on which they make this argument: One is that a minimum wage increase will kill lots of jobs, because business owners cannot afford to pay their workers that much. The second is that the increase in wages will drive up inflation. I will tackle these issues the way I like to tackle everything – by examining comprehensive economic data. These stats prove the job-killer argument wrong, by showing that 12 of the 20 wage increases did NOT result in a higher unemployment rate 12 months later. That includes the two biggest wage hikes, percentage wise, in 1950 and 1956. These numbers imply that minimum wage hikes actually improve unemployment numbers. For those who want to dwell on the few exceptions where the wage hikes were followed by large rises in unemployment, we have to keep in mind these hikes coincided with major recessions that were brought about by other causes ranging from OPEC to the banking crash. The ’73-’74 recession had seen three quarters of negative GDP (which is what defines a recession) by the time the minimum wage was enacted in May of ’74. In all major recessions, peak unemployment numbers lag behind drops in GDP by about 18 months (give or take a few months), so the job losses caused by falling production were mounting just as the wage was increased. The same goes for the 2008 increase. The high gas prices of 2008 hurt the economy, but then in the fall of ‘08 the banks crashed, so that by the summer of 2009, unemployment was reaching peak numbers. No matter how you slice it, there’s no consistent evidence here that minimum wage increases kill jobs. If anything, the largest increases created jobs. Yes, a small number of workers might lose their jobs in the short run and some small businesses may go under if they’re already struggling. But the vast majority of minimum wage workers, as well as those earning a little more than minimum wage who also see raises, spend their raises within the economy, so that business owners have to hire more workers to service the increased number of customer purchases. That’s why significant wage hikes lower unemployment (assuming of course, that all other factors influencing the economy remain the same). Here, 9 of the 20 minimum wage hikes did not result in an increased inflation rate. Yes, conservatives might argue that 11 out 20 times it did. But if you average all of these numbers together, you’ll see that the average increase in the inflation rate per minimum wage hike was only 0.5%. So if our average inflation rate is 2%, a minimum wage hike will increase it to 2.5%. That’s something the average person wouldn’t notice. Now the person who opposes a larger minimum wage hike all the way to $15 per hour might point to the largest wage hikes in 1950 and 1956 and say they increased inflation the most. That’s a fair point, especially since there was normally not much inflation in the 1950s. Since a $15/hr. minimum wage is more than doubling our current one, we are likely to see over 10% inflation as a result. That’s why we should apply caution in setting our new minimum wage rate. In the 1950s, 60s, and 70s, the minimum wage, inflation-adjusted for today’s dollars, ranged between $9-$11 per hour. So going to $15 would be unprecedented. So why is it that minimum wage increases cause very little inflation? It’s because most pricing is not set on the cost of production, but on the amount that consumers are willing to pay. I remember when I bought my first home computer in 1999. The computers with Pentium II processors had cost about $1500. But then when the Pentium III processors came out, they then cost $1500, and the Pentium II prices dropped to about $600. Is that because the manufacturer suddenly found a way to manufacture the Pentium IIs at less than half the price, but not the Pentium IIIs? The Pentium II prices dropped drastically, because customer demand for them fell so dramatically after Pentium IIIs hit the stores. Prices were set based on what consumers were willing to pay, not on the cost of production. Throw on top of that the fact that, in today’s hi-tech world, the cost of the technology to produce goods and services is usually far greater than the cost of labor, so that increasing labor costs have a minimal impact on the cost of production, and you’ll see why minimum wage hikes have far less of an impact on inflation than the average person might think. But you are now smarter than the average person for having read this article. So you just might want to share this newfound wisdom with your politically-conservative friends.